A rendering of what could come to a 10-acre downtown site that’s now on the market. A nearly 10-acre site near south downtown’s Garnett MARTA station is hitting the market. Gourmet Foods International is relocating from its headquarters at Ted Turner Drive and Whitehall Street. An affiliate of the wholesale food company now is seeking buyers for the property. SSG Realty Partners is marketing the site, calling it Artisan Yards and offering a glimpse to the high-rise development that could be built there. The marketing team is pitching the site as a “new creative center” and says it could house more than 10 million square feet of mixed-use development. Towers on the property could reach 50 to 60 stories, says SSG. A buyer could also remake existing buildings on the land, including large warehouses and a brick apartment building that dates back to the 1930s. 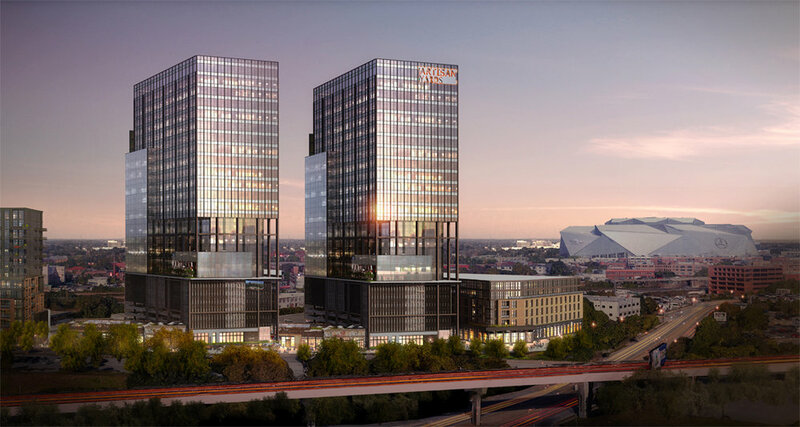 The property overlooks Interstate-20 and could benefit from big projects planned nearby, such as the massive redevelopment of the Gulch. “It is in the middle of all of the key downtown sub-centers and in close proximity to both historic Castleberry Hill district and the dynamic new sports and entertainment district emerging around Mercedes-Benz Stadium, State Farm Arena and the Centennial Park District,” Peyton Stinson, director of SSG’s Strategic Land Group, said in an announcement.